Hey all would it be disrespectful to change the label cuz i was messing with the label maker last night and came up with this. LOL pretty cool, I am certain nobody would object to you changing your own personal label, I prefer to keep mine as created but certainly that is the beauty of projects like this, do what you want! 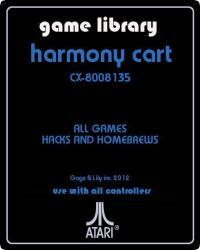 I love the Harmony Cart and Nathan Strum always does outstanding label art, but I've never liked the yin-yang. I don't mean on this specifically; I mean in general. I can't explain it and don't know why I feel this way, but I have a negative gut reaction to the symbol every time I see it. Odd? Maybe. I've always wanted to replace the label just for that reason, but probably never will. We'll see. (No tomato throwing, please). About your label -- disrespectful? Nah, it's your cart; you gotta go with what you like. 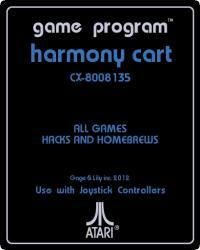 However, you may want to change the "Use with joystick controllers" to something a little more accurate. 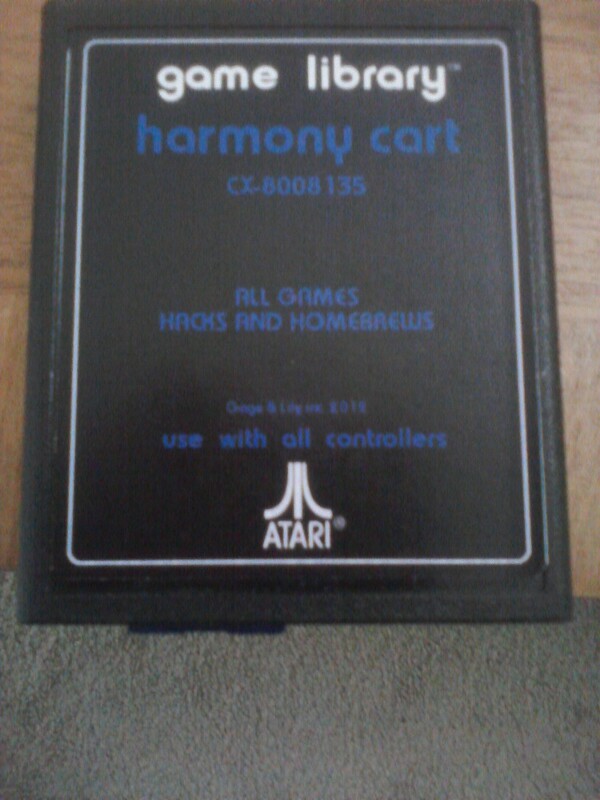 ...However, you may want to change the "Use with joystick controllers" to something a little more accurate. 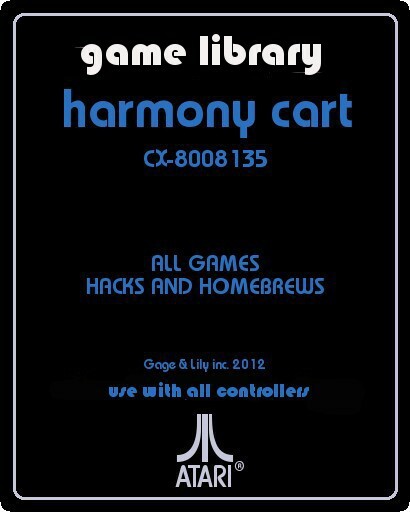 And change the "game program" to "game library"
I realize it was probably done on the web site, but you can use that as a starting point and put your own text over top with something like GIMP. 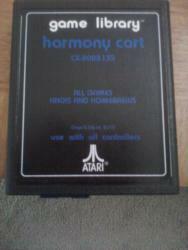 The fonts are on atariage somewhere. Yeah your right ill have to tweak it a litlle. Ok been messin with it some and heres what i got now. Me too,I think they look more technical. Things like this, basic programming, chess, checkers look perfect on them. Now get Al to print it up for you! He made my R.O.B. cart labels. They are real nice. Ok all done $1.20 later at staples and i got 4 labels. Stuck it on the cart and this is what i got. Not bad for just trying it on a whim lol. Not that hard with GIMP i advise anyone to try it . Looks good. How is staples printing? Do they print actual vinyl labels? Not that I would want to undercut Al, but turn around in hours would be cool. Edited by Pioneer4x4, Mon Apr 9, 2012 7:40 AM. 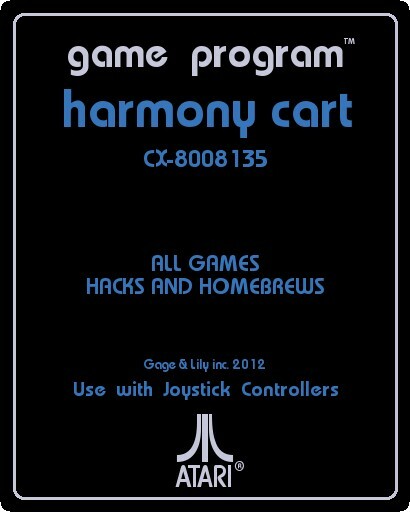 I love the Harmony Cart and Nathan Strum always does outstanding label art, but I've never liked the yin-yang. I don't mean on this specifically; I mean in general. I can't explain it and don't know why I feel this way, but I have a negative gut reaction to the symbol every time I see it. Thanks for the compliment. For what it's worth - I have the same reaction about the yin-yang. Consequently, that made the label more challenging to work on since Fred wanted the yin-yang included. But I just took it on strictly as a design element, and managed to come up with something that I was pretty pleased with. I look at every label as an opportunity to do something different, and there are things about every label I've done that I would go back and Lucas change if I could. As far as I'm concerned, if people want to change their labels - they paid money for their carts, and can do with them as they please. There are some carts of my own I'd happily rip the labels off of. But making new ones would be too much work. Incidentally, after we'd already started working on the label, I happened across this contest entry for the Krokodile Cart. Same concept, color scheme, and even type of product. Pretty bizarre, huh? Edited by Nathan Strum, Fri Apr 13, 2012 10:34 AM. Wow, I've never noticed that. 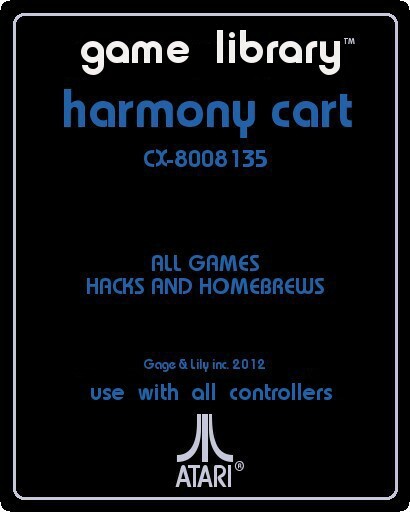 But it's worth pointing out that the yin and yang on Harmony weren't intended to symbolize a PC and a 2600 but rather ARM code and 6507 code running together in harmony. HEY, this is suppose to be about MY label!!!!!!!! Has anyone made an edge label? Something to print out and just cut holes for card and USB port. Could say SD card and USB below these holes perhaps. I made a few and sent to Fred Quimby, he had some additional wishes and I added that to the version I liked best myself as he didn't mention if and which one he liked the best. Cutting holes in photo paper is difficult, the top layer crumbles. Those are nice, middle top is my personal favorite. Very nice creations!! I also like the top middle the best with the singly harmony text second. I like the way it pops. That's the one I glued to my cart and also added some graphics to (click for full picture). I haven't heard from Fred in one and a half week so I haven't bothered cleaning up the AA-logo and such. Edited by e5frog, Wed Jun 26, 2013 6:49 AM. That's okay though. I wasn't planning to print out a label. 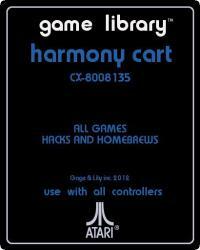 My Harmony cart is naked :-(. Is anyone willing to make me a label and I'll pay you? I tried printing and cutting, but it looks terrible. Can you buy an extra original one? I looked on the site and there is no way to contact anybody, just to buy it. Any help appreciated, thanks. Edited by RangerG, Wed Jul 17, 2013 1:55 PM. When you bought it, how do did you pay? Did you not get any shipping notice or similar? Edited by e5frog, Thu Jul 18, 2013 2:24 AM. Thanks so much e5Frog, I'll follow up. Edited by RangerG, Thu Jul 18, 2013 5:01 AM.